The ideal first cooking event of the fall would feature a visit to a pumpkin patch picking our some fresh produce while wearing a cable knit sweaters, the rustling brown and orange leaves tumbling past our feet and the nearby hay bales. Instead, today featured a sweaty walk to the farmer's market and selecting some items while wearing shorts and sandals to combat the 80 degree temperature and estimated 4,000% humidity. Life is usually a lot less like a Norman Rockwell painting than expected. 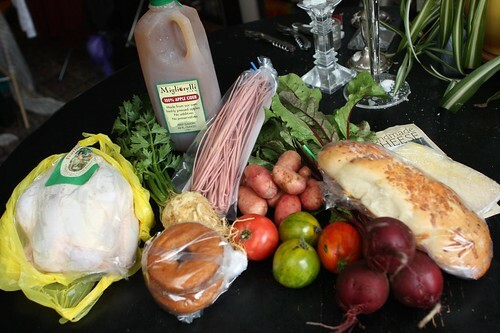 Still, I did go to the farmer's market in town and it was a pretty nice spread they had. I got celery root, French fingerlings, assorted heirloom tomatoes, and nice beets from Fishkill Farms; a piece of "Tewksbury" cheese (resembles a Beaufort) from Valley Shepherd Creamery; cider and donuts from Migliorelli Farm; red onion linguine from Flour City Pasta; a loaf of cheesy garlic bread from Our Daily Bread, and a small chicken from Feather Ridge Farm. 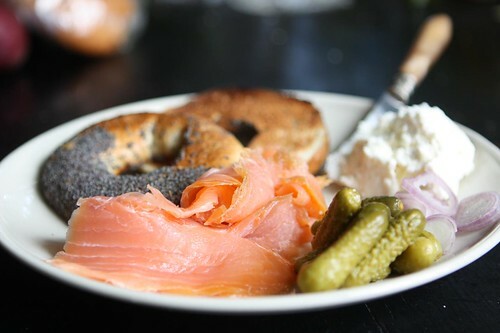 When I got back I made myself a lovely lunch of bagels from Jen's recent trip to Montreal, cream cheese, smoked salmon, sliced shallots, and cornichons. This is my ideal lunch. Given the choice I think I would have this every day until there were no more salmon left in the sea. We started off with the cheesy garlic bread. 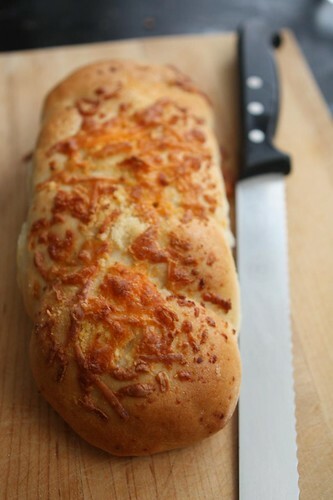 Since Jen was cheated out of a delicious cheesy bread the other night, I felt this was only right to make it up to her. 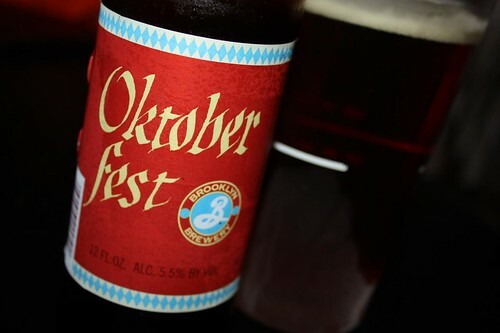 Before continuing with the Belgian beers bought for me by kind friends, or the other assorted beers in the much conflicted lower cupboards region of the kitchen, or brewing my own beer, it's time to continue with the Oktoberfest beers for this season. 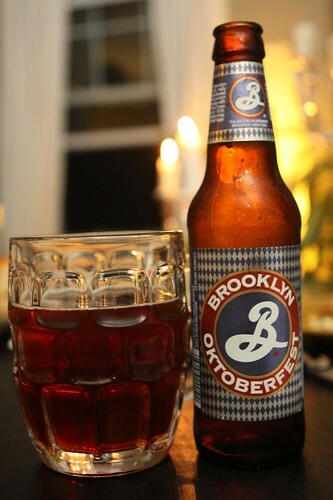 Tonight I started with the Oktoberfest from Brooklyn Brewery. I'm not good enough to be able to tell the difference between the 2011 batch and the 2010 bath but I can spot the difference in the labels. My eagle eye caught a few minor differences in the label. It was like one of those puzzles in Highlights magazine. If you look closely you can even see a rhinocerous hiding in the circular "B" logo. 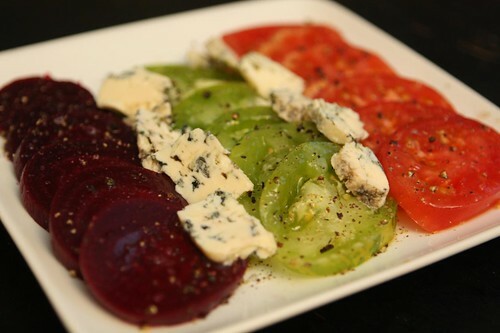 I started off by making this salad with sliced beets, heirloom tomtoes, and some of the leftover Fourme d'Ambert along with a little olive oil, salt, and pepper. 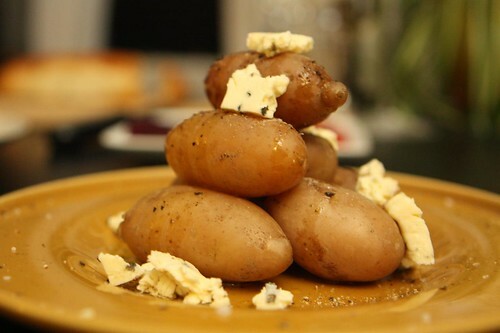 As a second course I boiled the fingerlings and topped them with a little olive oil, salt, and pepper. I then crumbled a little leftover Cambozola on them while they were hot. It was a good night for blue cheeses. 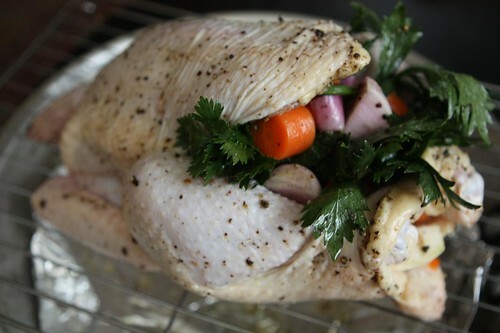 For the next course I chopped up some shallot, carrot, and celeriac, seasoned it, and stuffed the chicken cavity with it before roasting it whole in the oven. I'm normally leery of purchasing meat out of a cooler from a relative stranger but that's only because I was raised in America. 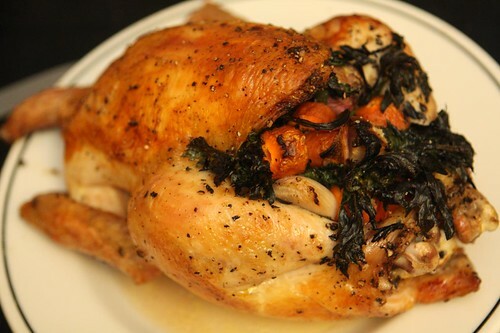 I also stuffed the fronds from the celery root into the chicken for two reasons. Firstly, I thought it would lend an added celeriac flavor and, second, I like to say, "Fronds." 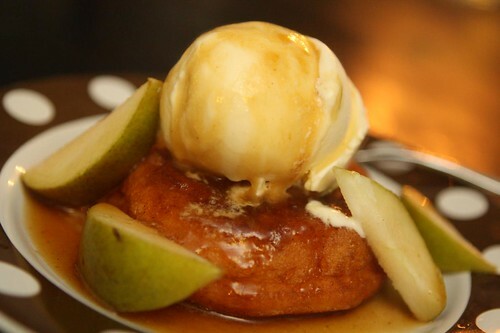 For the fifth course I served up the cider donuts with a scoop of vanilla ice cream, sliced Seckel pears, and a caramel sauce I made with the cider from Migliorelli Farm. The sauce was made from cider, brown sugar, a dash of vanilla, and a touch of butter. Sixth, and finally, I put out the Tewksbury cheese. Sadly the cheese is from New Jersey and not the gritty northern Massachusetts town with which I am familiar. 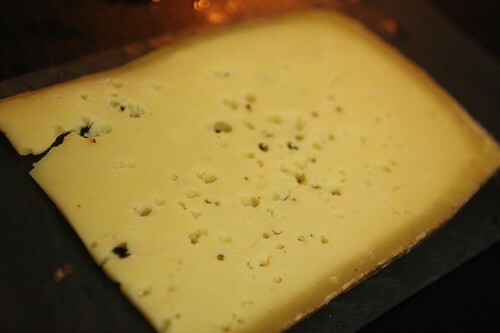 This is a delicious cheese which is similar in style to Beaufort. If that means anything to you then you know more about cheese than I do. All I know is that it was very good. 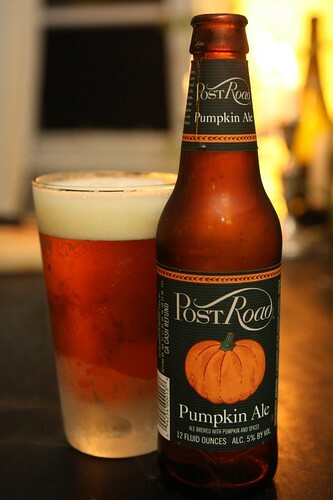 To accompany the cheese and dessert I opened the first pumpkin-themed beer of the season, this Post Road Pumpkin Ale, also by Brooklyn Brewery. This, as expected, had a bit more of a caramel flavor and paired nicely, particularly with the cheese. It's hard to find an appropriate beer that pairs both with donuts and cheese but if you are looking for one, I'd recommend the Post Road Pumpkin Ale. We don't usually have another course after dessert but since Jen loves this more than anything else I figured it was a suitable welcome home treat. Generally she ends up raiding the pickle jars in the fridge after dinner so this also serves a dual purpose of saving her the trouble. It also helps that I don't have to put away pickles that have been left on the counter. Coming this fall: everyone wins.